Mount Merapi had explotion and eruption in 2010. Mount Merapi (2911 m above sea level) is one of Indonesia's volcanoes are still active. The mountain is located approximately 30 km north of Yogyakarta City and included into the territory of the Province of Central Java and Yogyakarta. Mount Merapi closely related to myths, beliefs and philosophy of Javanese society, especially communities around the volcano. This is illustrated by an imaginary line that connects the Mount Merapi with the South Sea (Indonesia Ocean) with the city of Yogyakarta as the central point. Imaginary line had two philosophical aspects, namely the universe and the universe ageng alit. Let's continue The myth of Mount merapi - The Great Mount of Java in the next paragraph. Jagat traveling elite is the process of human life from birth to face the Almighty. Tugu Yogyakarta is the point at which humans can be united with God when he is able to take life with a correct and "straight". Yogyakarta City Planning describes the meaning of philosophy through the road that stretches from south to north. However, the journey of human life could not be separated from the temptations of power and luxury. The temptation of power drawn through Kepatihan complex, while the temptation of wealth is reflected through Beringharjo who are on the road between the Sultan and the Tugu Yogyakarta. Jagat meaningful Ageng a leader must give priority to the interests of society and the importance of conscience than the lust for power. Leaders must bases his leadership on the basis of belief in God. That is, the action must necessarily lead, based on what is allowed / ordered and forbidden by God. Therefore, the meaning of the imaginary line is that humans can be close and united with his Lord when he was able to interpret the true nature of life and behave as it has been commanded by God. Beyond the philosophical meaning that links the presence of Mount Merapi, South Sea, and the Sultan Palace, Mount Merapi is a natural phenomenon that has its own privileges. Until now, Mount Merapi is still one that is still active volcanoes in Indonesia. Since erupted in 1548, Mount Merapi has erupted 68 times. Small eruption of Merapi activity occurs every 2-3 years and a large eruption occurred about 10-15 years - the last in 2006. 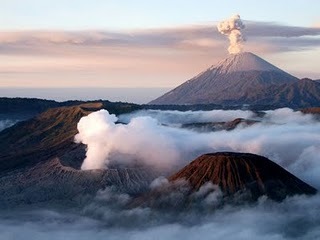 The eruption of Mount Merapi occurred in 1006, 1786, 1822, 1872, and 1930. The eruption in 1006 is what is claimed as the cause of displacement Hindu Kingdom of Mataram to East Java. Meanwhile, the eruption that occurred in 1930 cost the lives of 1369 people. Eruptive activity has resulted in a height and shape of the peak of Merapi continues to change from time to time. Climb Merapi is a challenge for you who like to adventure. The path to climb Merapi is not like the Like climbing lane. Sometimes the road is more like a trench from the top of the mountain. Similarly, along the climbing terrain: rocky, steep, and prone to landslides. Approaching Peak Garuda, the climbers to be extra careful and precise in making decisions because not infrequently trampled rocks precisely landslide - which can be fatal. 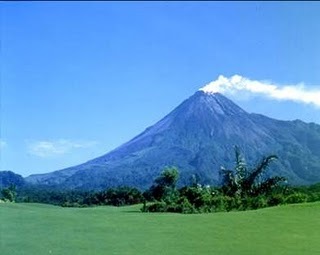 Mount Merapi offers a variety of interesting attractions. On the southern slope there Kinahrejo attractions that once a route from the south side. Here you can enjoy beautiful natural scenery or a visit to Tuk Pitu (seven eyes of Water). Or you can also meet directly with Mbah Marijan, caretaker of Mount Merapi. You can also visit attractions Kaliurang, Kalikuning, Kaliadem, or the National Park of Mount Merapi, which became the park nature conservation area of ​​Mount Merapi. Cool weather and beautiful scenery in this area will refresh you after a whole with the daily routine. Administratively Mount Merapi entered in the district of Sleman, Yogyakarta Province, Magelang regency, regency Boyolali, and Klaten district, Central Java Province. First, line the south side of Mount Merapi, through Hamlet Kinahrejo. This path can be said as a gate to enter the Mount Merapi. Post ascent was at home Mbah Marijan. Ascent of this pathway can be reached on average 6-7 hours to the summit. The climbers who take this path will immediately be faced with a relatively heavy terrain with a slope of 30-34 degrees. The novice climber should avoid this route because the terrain is heavy. To get Kinahrejo, you can use the public transport department Yogyakarta-Ground. Then, from Ground to Kinahrejo within walking distance. Second, the path Selo is on the north slope of Mount Merapi. This path is suitable for beginners in the morning the climbers climbing terrain that is not too heavy. The line was started from post ascent into the climbers basecamp. Command Post Plalangan ascent was in Hamlet, Village Lencoh. Transportation to reach this village: the majors Semarang Solo bus, get off at Boyolali. From Boyolali minibus ride to the Selo, Selo markets down at T-junction. From the T-junction towards post Selo markets climb a short walk about 1 km. It should be noted, minibuses Selo majors only until 17:00 pm. To climb Mount Merapi, you can simply write a personal identity in the guest book and pay for tickets at (unknown price) per person at the post climb. Around the tourist area of ​​Kaliurang, there are some hotels that charge varies. There are also some small restaurants offering a variety of food menu. In addition, you can use climbing posts, both in Kinahrejo and in Plalangan, as a place of rest before and after the ascent. In fact, you may as well stay here. In each post, there are several guides available to take you to the top. Some of them also functions as a member of the SAR (Search and Rescue). Usually, post this climb provides food and drink with a relatively cheap price. The young people around the posts that usually provide a souvenir in the form of stickers, t-shirts, keychains, and other trinkets. Before you start climbing, you must bring sufficient water supplies because you will be hard to find water on the slopes of Mount Merapi.